"Google said on Friday that for more than three years it had inadvertently collected snippets of private information that people send over unencrypted wireless networks. 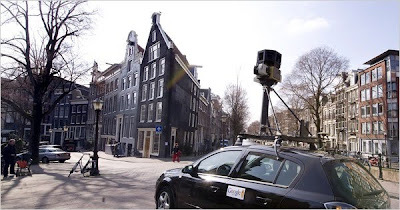 The admission, made in an official blog post by Alan Eustace, Google’s engineering chief, comes a month after regulators in Europe started asking the search giant pointed questions about Street View, the layer of real-world photographs accessible from Google Maps. Regulators wanted to know what data Google collected as its camera-laden cars methodically trolled through neighborhoods, and what Google did with that data."